Behind a long table sit a man and a woman. Both have microphones in front of them and from the labels in front of these we learn their names. Daniel and Sophia are dressed as if to read the news or attend a press conference. There is a carafe of water and a glass for each of them. The only other object on the table is a clock used in chess competitions. 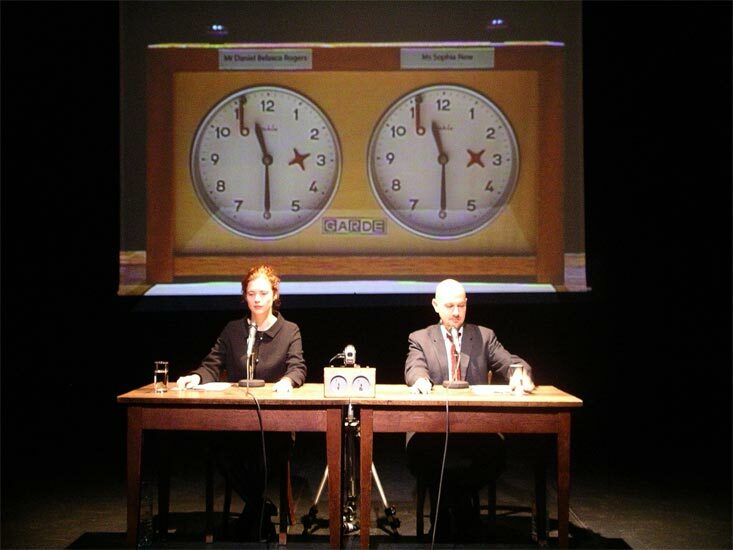 Behind them is a large video projection of the two faces of this same clock. The chess clocks are set at 11.30. Each have half an hour to tell the other and the audience the things they never said, things they remember or would just like the other to know before the hour passes. At the end of each person’s half hour, the chess clocks’ red indicator falls. When this happens, that person can no longer speak and has to wait for the other to finish their half hour. This concentrated hour is part endurance, part pleasure; they delve into shared territory or confess secrets the other never knew. They trigger thoughts and memories, one prompting the other. All the time they risk drying up, suddenly unable to think of the easy anecdote and having to dredge up the raw, unrehearsed material we all carry about those closest to us. The Last Hour continues plan b’s fascination with placing people in situations that require them to use spontaneously generated text, forcing them to confront what it is to be and perform ‘live’. Although only one hour, The Last Hour continues plan b’s ‘durational’ approach, setting a simple rule or context and letting it play out in front of the spectators. We only perform the Last Hour a maximum of once a year.